With equities snapping from an afternoon low of sp'2061 into the 2100s, the VIX was crushed lower, settling -10.8% @ 13.97. Near term outlook is for continued equity upside... which will likely equate to VIX cooling into the 12/11s.. as early as this weekend. *the opening VIX trades were pretty crazy this morning, with an opening low of 13.69. So.. with equities soaring on the 'FOMC relief', the VIX was crushed back lower. 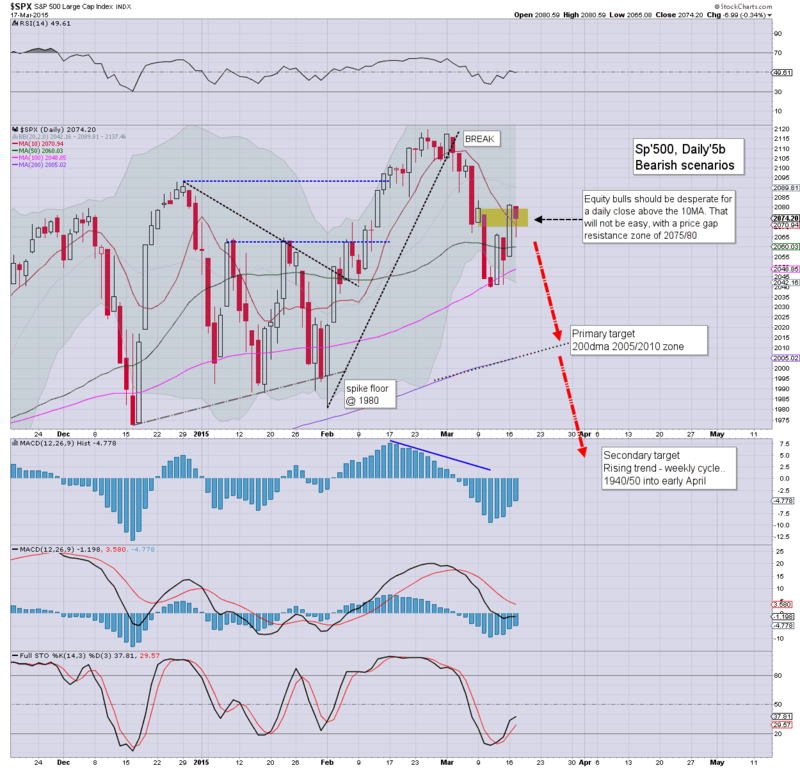 Yesterday's black-fail candle was (in retrospect) probably more of a warning than I was taking seriously. 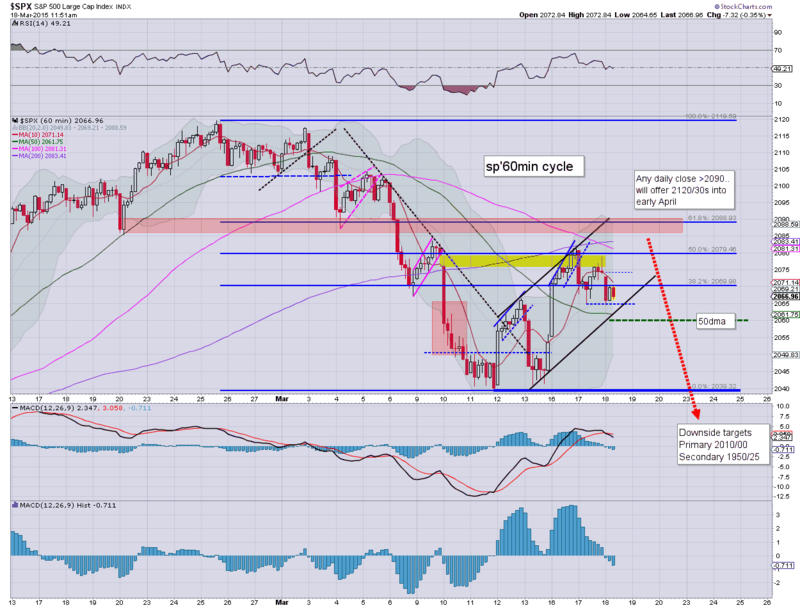 As things are.. the 12/11s now look viable.. as early as the coming weekly close. The big 20 threshold looks out of range for some weeks.. if not until at least May. 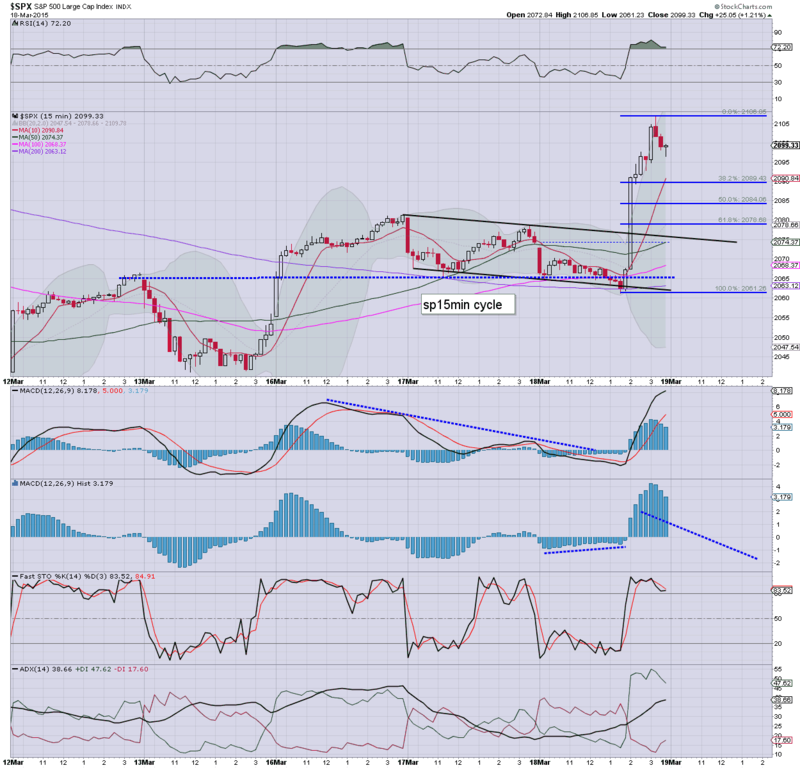 US equities saw a post FOMC hyper-ramp from sp'2061, settling +25pts @ 2099 (intra high 2106). The two leaders - Trans/R2K, settled higher by 0.3% and 0.8% respectively. Regardless of any minor retrace of today's gains, it would appear the market is headed for new historic highs.. into the 2120/30s. *I've added a 15min fib' chart.... it looks like high chance of a retrace to around 2090... perhaps 2080... tomorrow.. before renewed upside into the weekly close. So.... what to say about today? First.. as noted into the early afternoon, from a pure cyclical perspective, the 5/15min cycles were always in favour of the equity bulls. The secondary resistance zone of 2085/90 was decisively broken through.. and thus any hope of a reversal/broader downside is now OFF the menu. Yes, a minor retrace of today's hyper gains looks underway, but at best... maybe flooring no lower than around 2082/78. The smaller 5/15min equity cycles were notably setup in favour of the bulls. The move into the upper sp'2090s is now too high to offer any hope of broader downside... and the equity gains are being reflected in the VIX, -9% in the low 14s. Metals are climbing, Gold +$15.... Oil has seen a hyper swing from -2.2%... to +3.4%. The index thresholds were clear... and we're now way too high to have any expectation of broader downside in the days ahead. A natural retrace of today's ramp would be to the low sp'2080s tomorrow morning... but from there.. a weekly close in the 2100s is now very much viable. Notable gains, energy stocks, RIG +5%, SDRL +7%.. although both remain broadly weak... and Oil still looks set to lose the $40s. 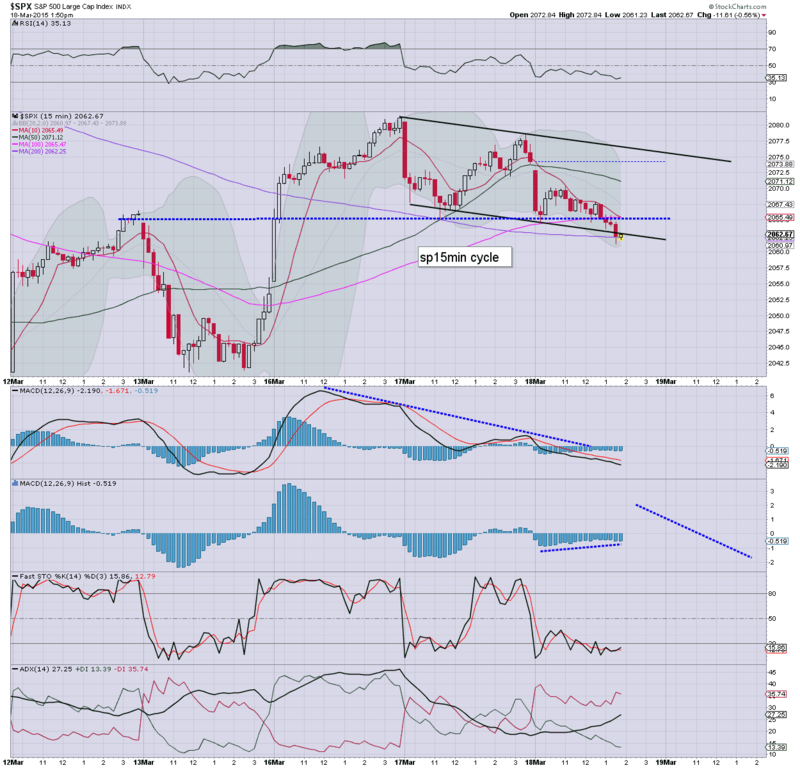 3.09pm .. sp'2102.... as noted earlier... market has ramped too strongly for any hope of broader downside. Whether we close above.. or below sp'2100... of little importance. 3.22pm sp'2106... incredible gains.. a true day of horror for those in bear land.... reflected in the VIX, -14% in the 13.40s. 3.42pm.. minor down wave.... viable micro top of 2106.... first downside 2092/90. To be clear though.. broader trend is clearly bullish now.... too many levels broken to break <2060. 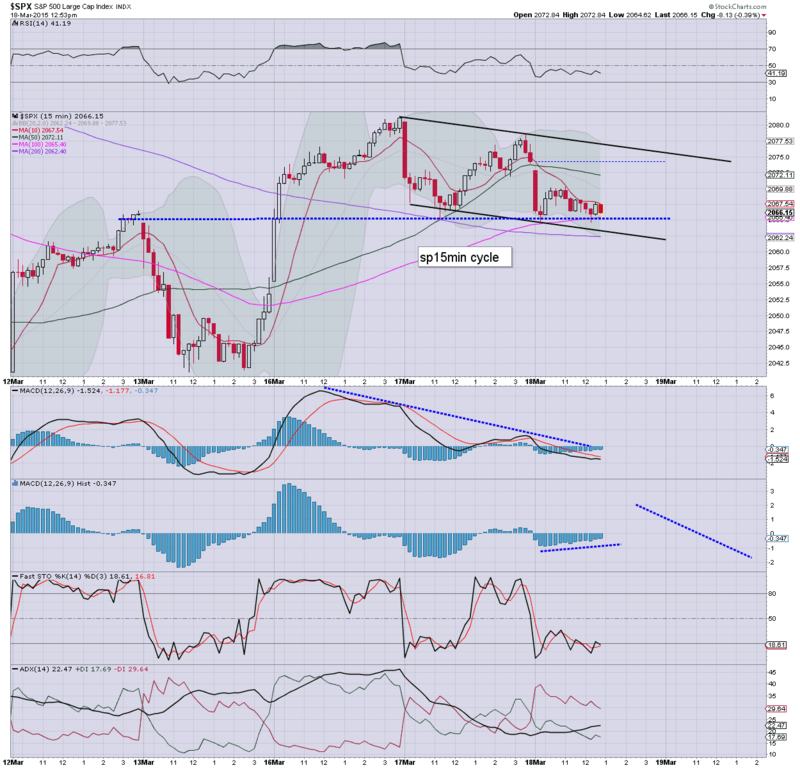 2pm update - Yellen to take away the patience? 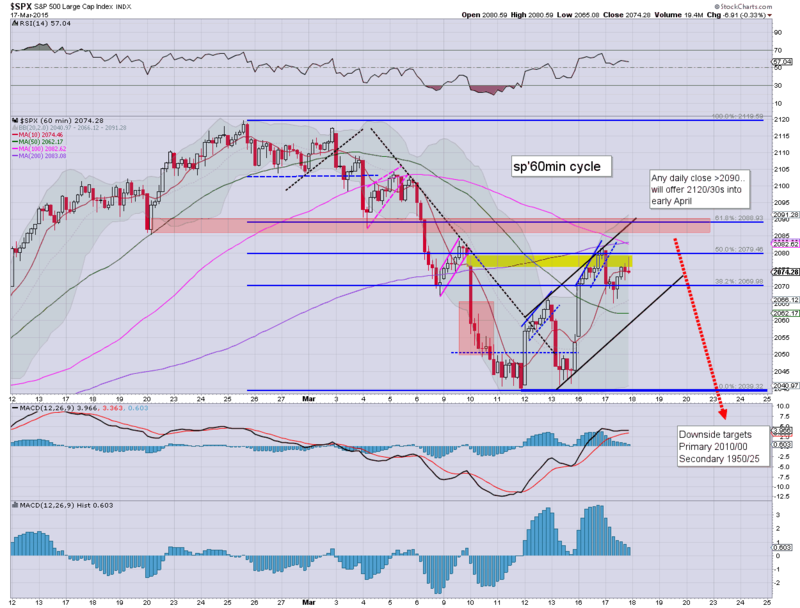 US equities remain moderately weak ahead of the FOMC announcement. The smaller 5/15min cycles are highly suggestive of at least initial upside, with the hourly offering sp'2085 or so. Metals look vulnerable into the close, Gold +$4. Oil remains weak... -1.2%. Well.. its almost time... lets see whether Yellen takes it away. 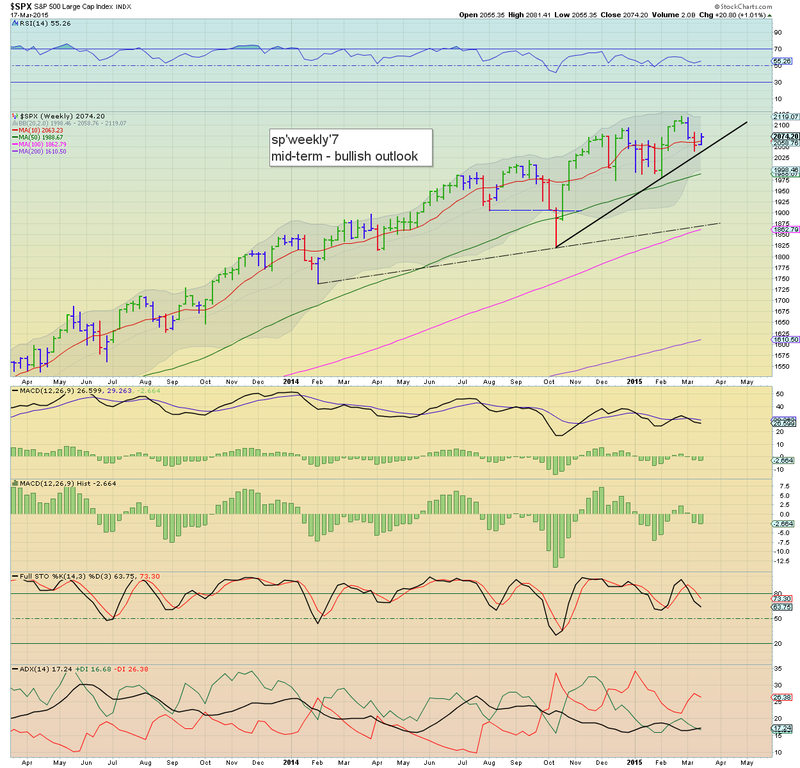 Market is highly vulnerable to upside to around sp'2085. Bears are going to need to wave the white flag on any sustained trading >2090. 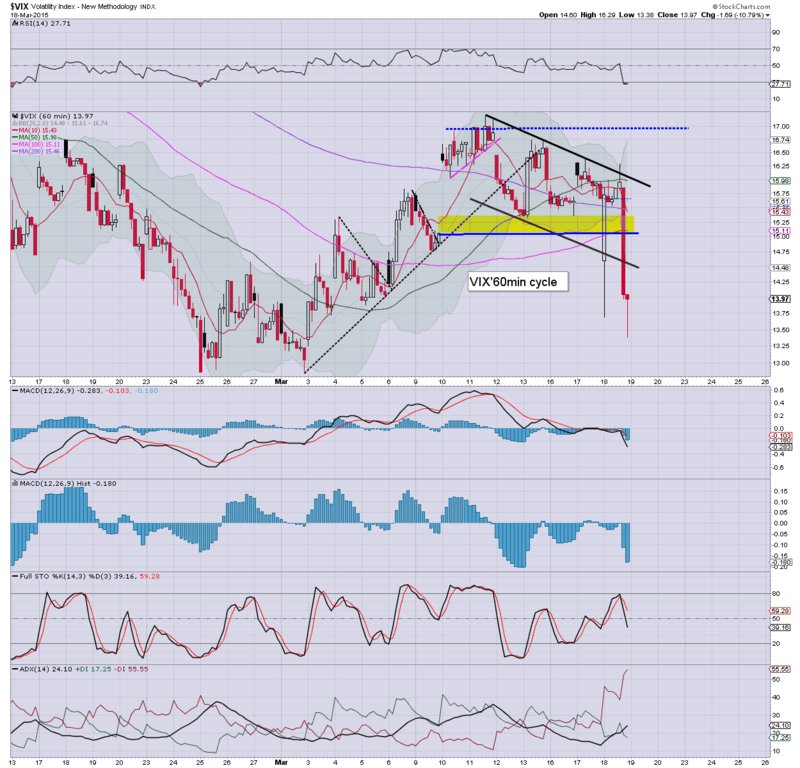 On the flip side.. a loss of the 50dma @ sp'2060 would be a major problem for the bears. One thing no one can dispute.. the thresholds for today.. are pretty clear. Intra-hour updates... ALL the way into the daily close! 2.02pm.. hyper-spike ramp... sp'2081.... market vulnerable to getting stuck around here. 2.15pm.. With the move to sp'2092... we're above upper resistance... bears look toast. Chances of a reversal.. now look minimal. VIX crushed... -9%... low 14s. Clear spike floor of sp'2061.... incredible 20min ramp. 2.31pm... Well, its the natural turn time, but with sp' already hitting 2094... its arguably broken too many levels to have any hope of sub'2060. 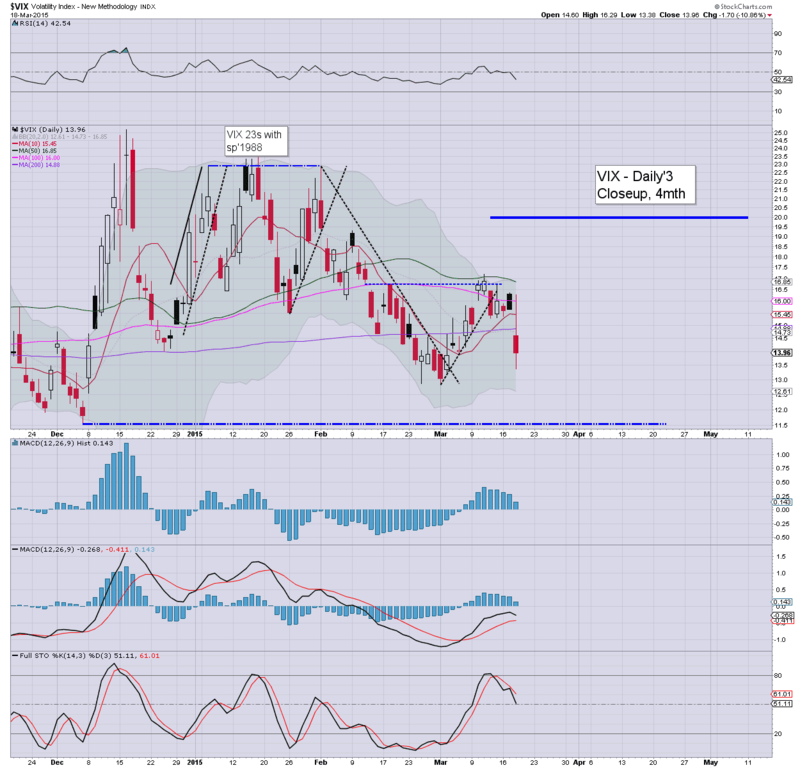 VIX is confirming the move, -8% in the low 14s. 2.37pm... sp'2100s due.... bears nuked... anyone not stopped out is going to get zeroed out. 2.45pm.. .. and now talk will swing to Nasdaq 5K again. In any case.. anyone still short >2090... pointless. 1pm update - a spike... and a fail? US equities remain moderately weak, but for now... comfortably holding above the key 50dma of sp'2060. The smaller 5/15min cycles are primed for a spike AFTER the FOMC announcement. Whether the bull maniacs can hold the gains.. that is the issue. *across remainder of the day, I will probably highlight the smaller 15... or even 5min cycles. Smaller equity cycles favour the BULLS... at the time of the announcement. Hourly cycle will be offering a new multi-day high of 2085 or so... but the issue is whether we just end up with a huge spike-fail candle. Any sustained trading above 2090.. and bears will have to wave the white flag.. its that simple. US equities remain moderately weak, but price action is reflecting a market that is essentially in a holding pattern ahead of the 2pm FOMC announcement. Metals are holding minor gains, Gold +$2.. but vulnerable to a severe afternoon snap lower. Oil remains broadly weak after another huge surplus, -1.6%. The key threshold is clearly around sp'2060... any move under that.. and it bodes badly... otherwise... there remains threat of renewed upside on more crazy 'fedspeak'. I see too many individual stockcharts too convince me we are more likely to rally (beyond today).. than decline. Best guess.. a brief spike higher after 2pm... but one that will be extremely vulnerable to reversing. The latest EIA report offered another weekly surplus of 9.6 million barrels of WTIC Oil. Storage is (not surprisingly) finite... the low $30s look due this spring. 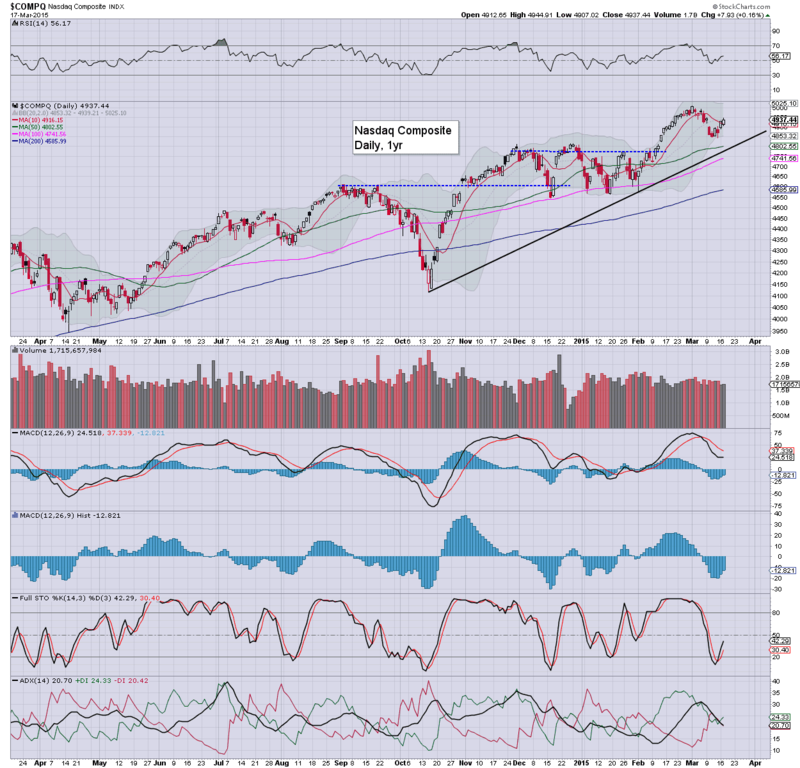 Meanwhile.. equities are in minor chop mode... comfortably holding the 50dma.. but that looks vulnerable near the close. So.. another massive weekly surplus of Oil. Its amusing how most remain in denial at the finite storage issue. Sure.. they could even transport some to Canada... but at 7-9 million a week... Mr Market has yet to properly adjust. Notable weakness: DISCA (Discovery), -2.1%.. and starting to look real ugly on the monthly cycle - viable downside to 25/20 into the summer. I like the company.. but not at this time.... and certainly not at $31. *to be clear... I don't expect sustained action in the sp'2050s this morning.. or indeed until late afternoon. Notable weakness: ADBE -5.5%, post earnings depression.. subscription numbers missed. 10.31am.. 9.6million surplus... that is ugly ugly ugly number! We're now averaging 7-9 million barrels weekly surplus so far this year.... at this rate... storage will be maxed out within a month or two. WTIC Oil is set to lose $40.... target 35/30......... no doubt. .talk of the 20s will start to re-appear in the mainstream. Good morning. Futures are moderately lower, sp -8pts, we're set to open at 2066. Metals are a touch higher, Gold +$2. Oil remains under severe pressure - ahead of the EIA oil report, -1.4%. The capital markets await.... the FOMC announcement at 2pm. So.. we're set to open a little lower, like yesterday. However, market is likely to remain in minor chop mode ahead of the fed. *the EIA oil report - due 10.30am, will be very important. 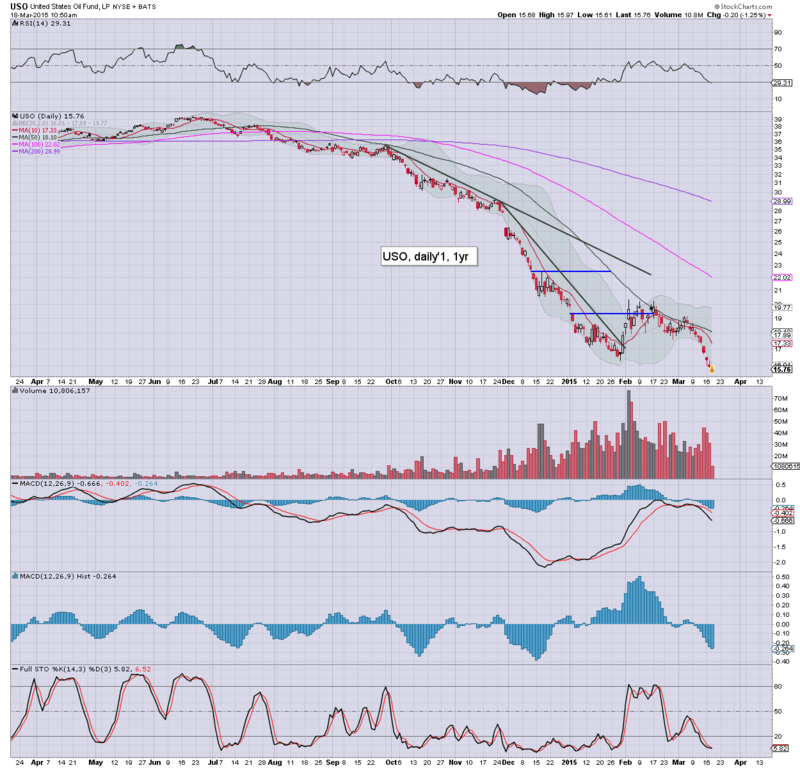 Any surplus >7 million is going to really pressure Oil... and a daily close in the 41/40s is probable. Sub 40s are easily possibly by the weekend. Arguably, the prime time for an index short will be around 2.05/2.15pm... just after the announcement. Many times the market can briefly spike.... only to then reverse all the way into the close. My best guess? 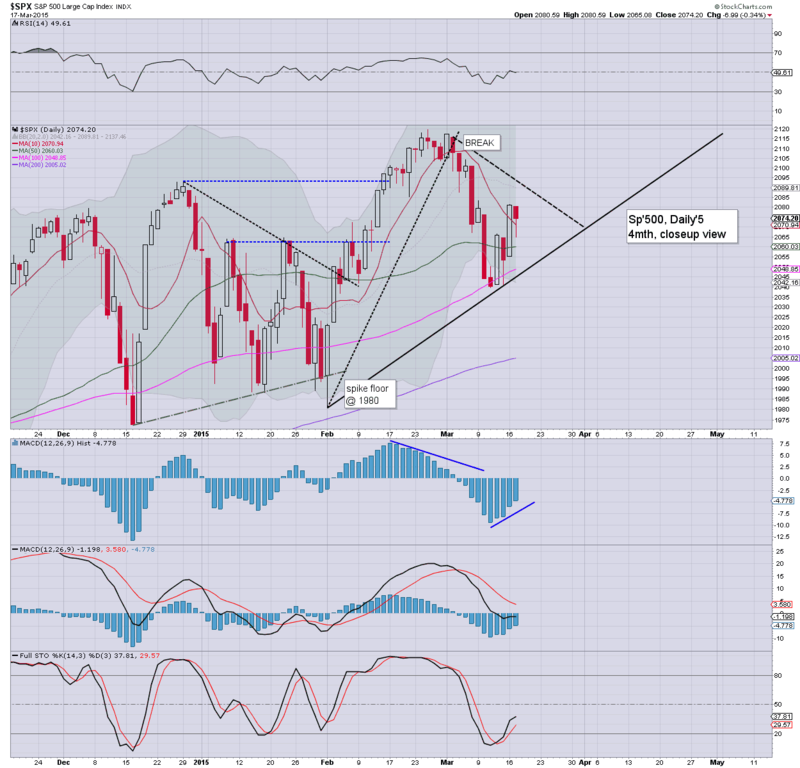 Assuming we don't break and hold 2090... there appears HIGH chance of a bearish market reversal. If so.. first soft target is the 50dma of 2060.. but would not likely hold... opening the door to the 200dma at 2005 next week. In the grander scheme, we're still only talking about a downside swing of around 3-4%. There is broader trend support in the 1950/25 zone.... but first things first.. lets see if we get stuck this afternoon. It is notable to finally see (only took Mr C. eleven weeks) to issue an end year target of 2300/350. That is broadly inline with a fair few others who submitted a number at the start of this year. Further it would be the mere continuation of trend, it really isn't that bold an upside target..
As for Gold, I'm in broad agreement, and there is a VERY high probability Gold will take out the Nov' low of $1130 within days. We have a long day ahead... enjoy. As ever, please feel free to say hello, it is always good to hear from some of you during the day. From 2pm onwards, intra-hour updates will be pretty fierce... so... stay tuned, on what will be one of the busiest days I have. 9.38am... INSANE spike lower on VIX... 13.69.... with a hyper-spike reversal candle for VIX opex (first print of the day is the settlement). 9.44am... the VIX daily candle (assuming equities close in the 2060s.. or lower) will be a truly wacky reversal... marking a rather stark key turn. Notable weakness: Oil -1.9%..... but hey.. some consider that 'not important'. US equities settled moderately mixed ahead of the next FOMC announcement. 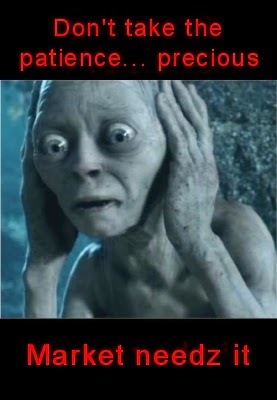 Naturally, the chatter remains one of 'will they.. or won't they remove patience?'. Most notable, today saw the second bullish F flag in three trading days fail. There is high probability of a bearish reversal from sp'2085/90 tomorrow afternoon. Yes, the bulls have managed a significant counter rally from the Wed' low of sp'2039... but there is clear resistance around 2075/80s. Best guess... market gets stuck tomorrow.. and breaks lower for the rest of the week. Market will be focused on the FOMC announcement at 2pm.. with a Yellen press conf. around 2.30pm. *there is the EIA oil report at 10.30am.. any surplus above 7 million barrels would likely kick WTIC Oil into the 41/40s. Sub $40 by the weekend remains VERY viable. US equities closed moderately mixed, sp -7pts @ 2074 (intra low 2065). The two leaders - Trans/R2K, settled -0.1% and +0.2% respectively. Near term outlook offers a FOMC spike to 2085/90 zone... before a strong reversal. The manner in which the market closes Wednesday will be pretty important. Little else to add... on what were relatively minor moves.. ahead of the Wednesday FOMC.